One of the first Chevrolet Bolts delivered in Canada arrives at Bourgeois Chevrolet in Rawdon, Que., back in January 2017. RAWDON, Que. — A small corner of Quebec cottage country has quietly become the electric car capital of Canada, driven in part by the unlikely success of a small-town dealership. The region of Lanaudiere, north of Montreal, has the highest per capita electric car ownership in Quebec, according to the provincial electric vehicle association. Quebec accounted for nearly half of all of Canada's electric car sales in 2016. Several factors make Quebec fertile ground for electric cars. Electricity is relatively cheap due to abundant hydropower. The provincial government offers sales rebates and recently passed the country's only legislation requiring automakers to sell a minimum number of electric, plug-in hybrid and hydrogen fuel-cell vehicles for the 2018 model year. And many residents pride themselves on their environmental sensibility. 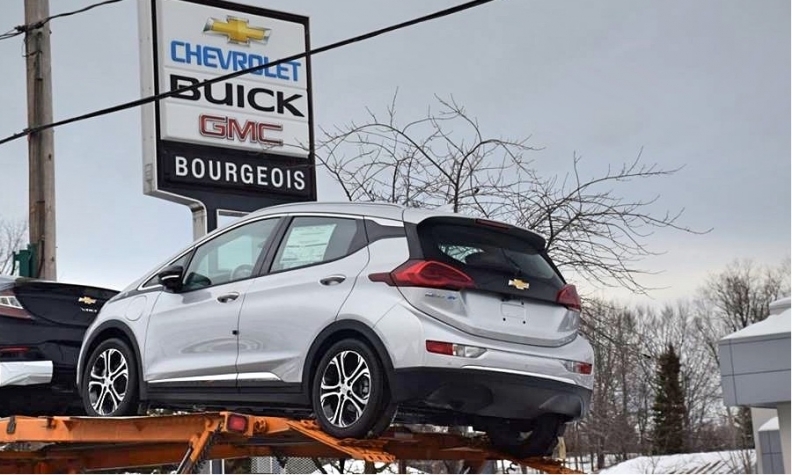 But the leading position of Lanaudiere is also due to Bourgeois Chevrolet in the small town of Rawdon, which industry experts say sells more electric cars than any other traditional dealership in Canada. Co-owner Hugo Jeanson says the dealership's decision a few years ago to focus on electric cars as a way to grow the business attracted a following, with customers coming from as far away as New Brunswick and British Columbia. Nearly half of Bourgeois's car sales are now electric vehicles. "I don't know why the other dealerships are not embracing the movement and the turn in technologies, but I'm not complaining," he said. Three generations of the family have been selling cars since 1959 in the town, where the population of about 11,000 swells in the summer with visitors. The dealership sold almost 400 new and used electric cars last year, primarily the plug-in hybrid Chevy Volt, Canada's top-selling electric vehicle. It recently halted orders for the all-electric Chevy Bolt after selling out for the year. Jeanson credits the dealership's success to having many models on the lot, training staff about electric cars, paying them salaries instead of commissions and letting prospective customers test-drive the cars for several days. The dealership has also donated chargers to local businesses, helping to encourage demand. Financial planner Alain Morin was one of the early converts, purchasing a Volt from the dealership in 2012 because he was tired of filling his truck with gas. "I'm not an environmentalist, but I still think it's important to use less gas because you have to think about the future," he said outside the dealership. While he believes the province needs more charging stations, he expects the network will expand and complement the cheap fill he gets at home thanks to low Hydro-Quebec rates. Quebecers pay about 10 cents per kw/h to charge an electric car from home. In Ontario, the rate can be nearly double that during peak usage hours. Montrealer Xavier Gonzalez says a combination of wanting to save on gas and a desire to be more ecological pushed him to trade in his minivan for a luxury Tesla. He also credits Quebec's $8,000 government rebate on electric cars. "I don't even know what the price of gasoline is anymore," he said, a day after collecting his new Tesla X.
Jeanson says he's lost some Ontario customers since the neighbouring province last year began to offer a rebate of up to $14,000. But he hopes a new $4,000 rebate for used all-electric vehicles imported from outside Quebec — introduced in last month's provincial budget — will lift sales. Nissan Canada, which makes the electric Leaf, said the new rebate solidifies Quebec as a leader in electric vehicles. Its dealership in Sherbrooke sells the most new Leafs in Canada. The Leaf was the third most popular electric vehicle in Canada last year, with 1,375 new cars sold, according to Green Car Reports. It trailed Tesla, which sold almost 2,500 cars, including 1,466 Model S and 1,032 new Model X vehicles. Electric vehicles still make up only a sliver of the market. The Canadian Automobile Dealers Association said just 0.56 per cent of vehicles sold across Canada last year were electric. But proponents note the technology is in its infancy. "We can't expect what is an entirely new way of driving and automobile ownership to take hold in a short period of time," said Francois Lefevre, chief marketing manager for Leaf at Nissan Canada.